KDocs is back again with more documentaries and more speakers than ever before. Starting on Feb. 15, documentary film lovers will be able to attend the festival at Vancity Theatre on Seymour Street in Vancouver. Those who go will be able to check out a the latest documentaries and listen to panel discussions featuring directors and activists. Janice Morris, the festival director of KDocs, has been with the organization since its beginnings in 2012. “We look at all the various films that have any kind of social justice topic or theme or approach or interest. We make a gigantic list and then start looking at the trailers of every single one of them,” she says. The list of documentaries that KDocs began reviewing last summer included approximately 200 titles. Over the following months, the organizers whittled their list down to a final selection of 14 films that will be screened this year. Some of the films they decided to show include Solitary, directed by Kristi Jacobson, and Vancouver: No Fixed Address, directed by Charlese Wilkinson. For the latter, long-time Vancouver activist and prolific housing advocate Jean Swanson will be the keynote address at the film’s screening. Swanson ran for a seat on Vancouver City Council last term and campaigned on the promise of introducing measures to combat the housing crisis. Some of these included implementing a mansion tax for homes over $5 million, using the money to fund more social housing development. She has also been involved with the Carnegie Action Project for the last 12 years, fighting gentrification and working to create more affordable housing for people with low incomes. “[Vancouver: No Fixed Address] is mostly interviewing people who are experiencing the Vancouver housing crisis,” she says, adding that she plans to discuss solutions to this crisis during her keynote address on Feb. 16. Morris believes that it’s important to feature a variety of presenters, especially those representing the voices of women. Exhibitors and representatives from social justice-focused organizations like Climate Convergence, the B.C. Civil Liberties Association, Amnesty International, Black Lives Matter Vancouver, and the Vancouver Tenants’ Union will be in attendance throughout the four-day festival. 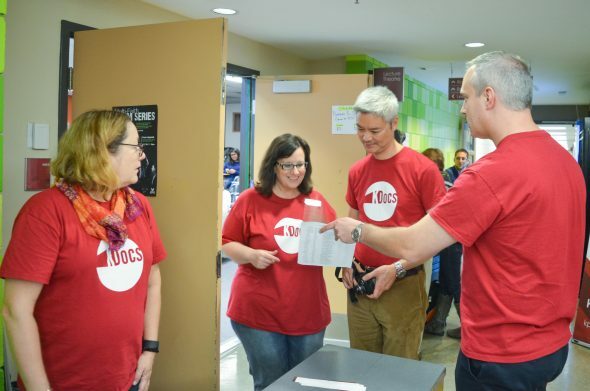 “This is a chance for our guests to be more than passive receivers of information, but rather, to interact, to sign up, to volunteer, to participate,” says Morris. The festival will run from Feb. 15 at 4:30 p.m. until Feb. 18 at 9:00 p.m. The full schedule, guest speaker list, and ticket purchase form is available at kdocsff.com.